When is the February 2017 solar eclipse? This month a solar eclipse will occur and be visible in certain areas around the world. The moon will pass in front of the sun on February 26, leaving a small halo of light around it. It will then be visible across the South Atlantic Ocean and will end in south-western Africa at sunset. The natural event will start in Chile and be seen across parts of southern South America in the morning. When Start the Solar Eclipse? This month's solar eclipse will begin at 12:10 UTC, reach its maximum point at 14:58 UTC and set at 17:35 UTC. Of course, up here in the far reaches of the northern hemisphere, we won't be able to witness the event. 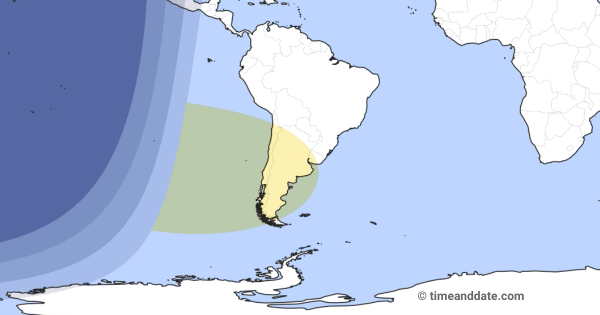 Chile can see annular solar eclipse. Annular Solar Eclipse soon over. Thank you for followving this beautyfull events in our site. Come back next time The Great American solar eclipse when we present for you the TOTAL eclipse. Clouds are unfortunately hiding the eclipse from the telescope providing our LIVE feed in Africa. We are currently streaming an image of the Sun which will not be eclipsed. This eclipse was also visible at the South Pole, but only as a partial solar eclipse. At this moment, the inhabitants of the Amundsen-Scott South Pole Station are presumably packing away their eclipse glasses as the Moon leaves the outer rim of the Sun’s disk. O eclipse solar agora em SÃ£o Paulo. 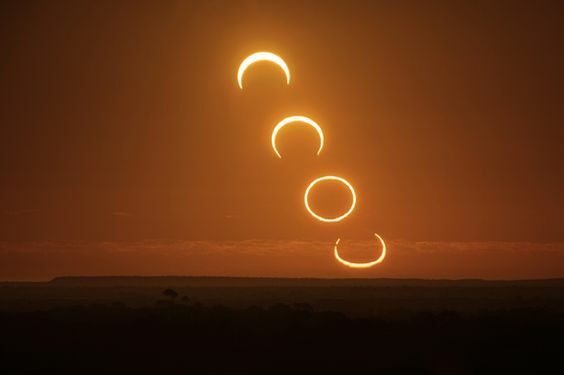 The Argentinian coastal town of Camarones is the last South American location to witness the annular phase of this solar eclipse. With clear skies, the around 1,000 inhabitants will be able to see the ring of fire, as the Moon positions itself directly in front of the Sun. Weather permitting, thousands of people in the Chilean city of Coyhaique are now witnessing the ring of fire that is characteristic for an annular solar eclipse. It will be visible for about 1 minute. The reason why the Moon doesn’t cover the Sun completely, like during a total solar eclipse, is that it is currently quite far away from Earth, so it appears smaller than the Sun. Ring of fire has just formed! The areas mentioned earlier can so far only see a partial solar eclipse. The ring of fire (annularity) that is typical for an annular solar eclipse is not visible yet from any location on Earth. But that is about to change. 3 minutes to go to annularity! In cities close to the annular path, like in Rawson, Argentina, the eclipse will still be a stunning sight as a large partial eclipse. In Rawson, the eclipse starts in a minute and reaches the darkest point in just under an hour and a half, at 13:43 UTC. And it begins! Somewhere in the South Pacific, about 2100 km (1300 mi) west of mainland Chile, the Moon begins to move in front of the Sun at this very instant. In 1 hours, the Moon will start moving in front of the Sun. 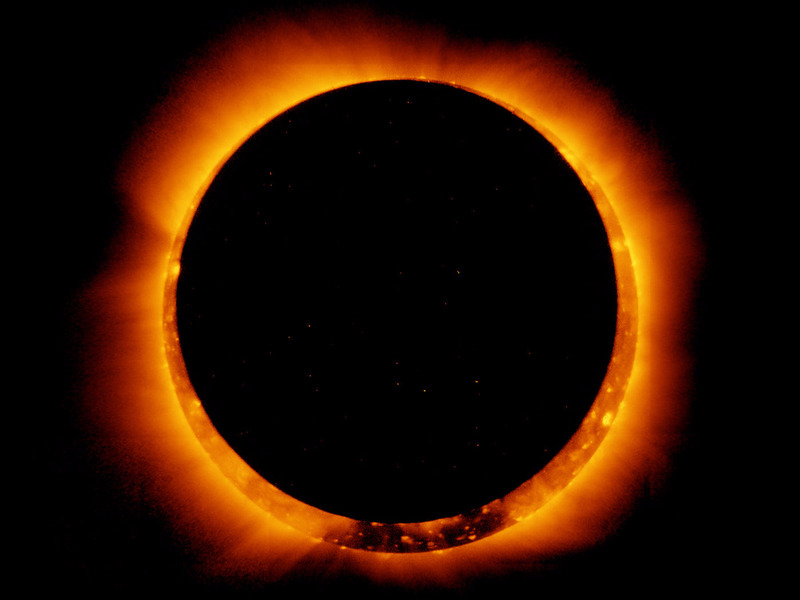 A solar eclipse occurs when the moon passes directly between the Earth and the sun.However, the distance between the Earth and the moon at the moment of the eclipse can dictate the type of eclipse that spectators will see.As a result, the moon does not always block out the entire sun.This bright ring of sunlight around the moon at the height of the annular solar eclipse is how it earned the nickname the "ring of fire" eclipse. As more than half of the Sun’s disk is now obscured as seen from large parts of southern Chile and Argentina, the inhabitants of Antarctica’s northernmost research stations, such as the Belgrano II Base, are able to see a smaller partial eclipse - weather permitting. 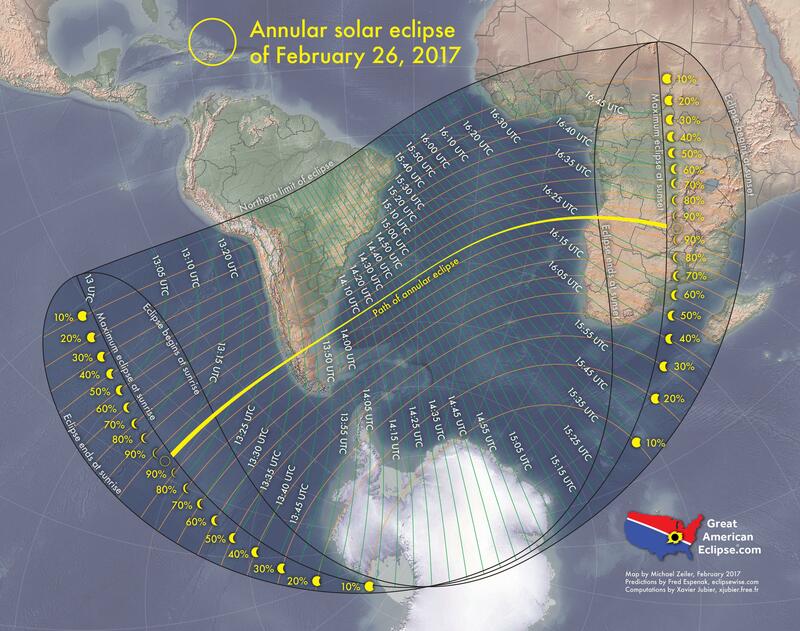 The eclipseâ€”during which the Sun will all but disappear as the Moon crosses its pathâ€”will be most visible in a 100-kilometre (62-mile) band cutting through Chile, Argentina, Angola, Zambia and the Democratic Republic of Congo. 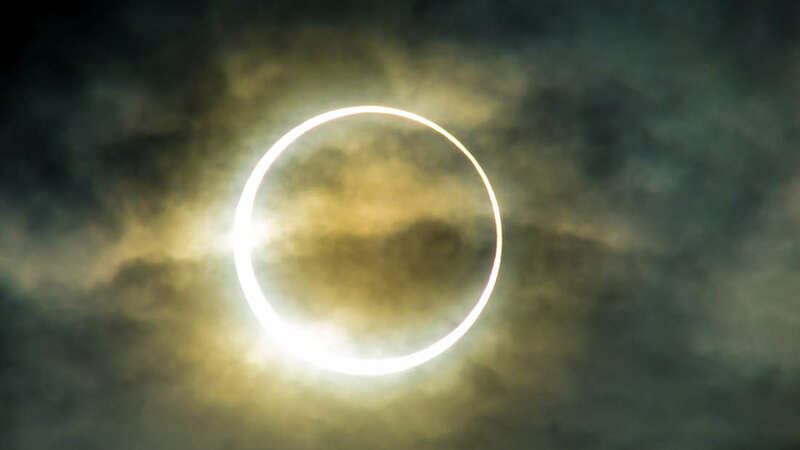 Tis the seasonâ€¦ eclipse season that is, as a spectacular â€œring of fireâ€ annular solar eclipse marks the end of the first of two eclipse cycles for 2017. 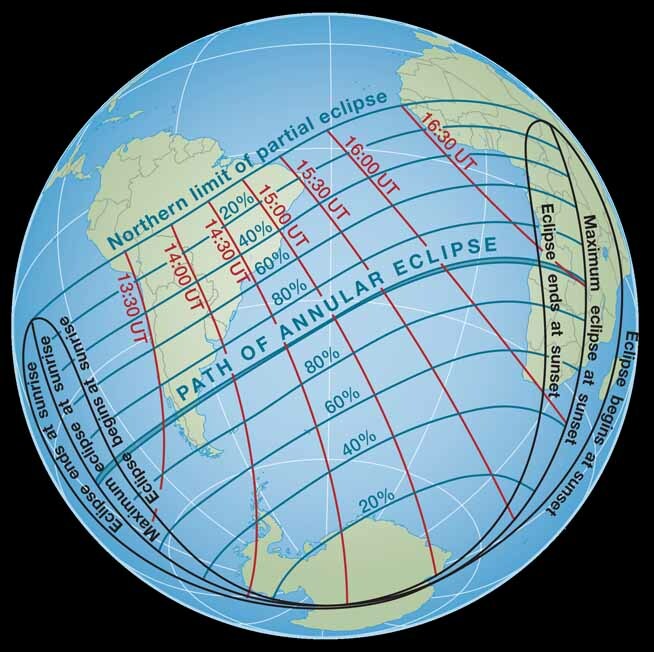 And although the annular path for this eclipse passes through some sparsely populated parts of the southern hemisphere, we just might get some amazing live views, courtesy of modern technology and some intrepid observers willing to adventurously trek after the shadow of the Moon. Unlike many of the uncertainties in life, eclipses are sure to happen, a certainty ordained by orbital mechanics. Well, okay, the Vogons could always blow the Moon to smithereens this fine Thursday afternoonâ€¦ but otherwise, weâ€™re in for a true celestial show. This month, the new Moon on its orbital tilt is set to pass between the Earth and the Sun, transforming the ball of fire into a brilliant ring of light. But astronomy buffs will want to know how to see the 2017 annular solar eclipse on on Feb. 26 â€” because most of the world's population will have to do quite a bit more than just "look up" to witness this remarkable celestial event. But with a little ingenuity (or, y'know, access to a livestream), you should still be able to witness this gorgeous, fiery event.